Shares of the tech giant started Tuesday up 1% but the gains trailed off in afternoon trading, snapping a nine-day winning streak. The multi-day rally came after Apple's celebrity-packed event on March 25 initially disappointed investors and Wall Street. Now that the dust has settled, the focus has returned to Apple's flagship product, the iPhone. "After a turbulent few months, calm is being restored," Wedbush tech analyst Daniel Ives says in a note Tuesday. Apple's stock just ended its nine-day winning streak. Shares of the tech giant started Tuesday up 1% but the gains trailed off in afternoon trading, snapping a nine-day winning streak. The last time Apple posted nine straight days of gains was in September 2018. Still, the multi-day rally came after Apple's celebrity-packed event on March 25 initially disappointed investors and Wall Street. Now that the dust has settled, the focus has returned to Apple's flagship product, the iPhone. While the tech giant has suffered from slowing demand for the smartphone, it still holds a leading position in the market, analysts said. "After a turbulent few months, calm is being restored," Wedbush tech analyst Daniel Ives said in a note on Tuesday. "With some recent price cuts demand trends are slowly turning around in this all-important region [China] for Cupertino." Apple is headquartered in Cupertino, California. 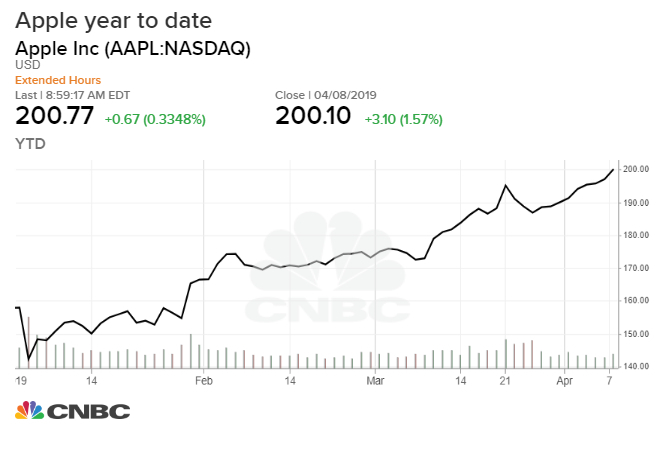 A recent survey of 8,000 teens by Piper Jaffray shows Apple's place as the dominant device brand among teens "remains well intact," analyst Michael Olson said in a note to investors Monday. The analyst reiterated his overweight rating on Apple shares with a $201 price target.